Idea Movie Club offers classic to latest movies, more than 80 Live TV channels, last 7 days of recorded TV Shows, short videos, trending trailers, assorted YouTube videos, music videos and a lot more. Get surprised by diverse and fresh content every week. Idea Movie Club is a super-app for movie buffs, short video streamers and TV lovers. Now enjoy Free 90 Days Trial. Offer valid only for Idea users. Subscribe to this trial before 31st March to access all movies/trailers/videos for free for next 3 months on 3G/4G and 1 month on 2G. 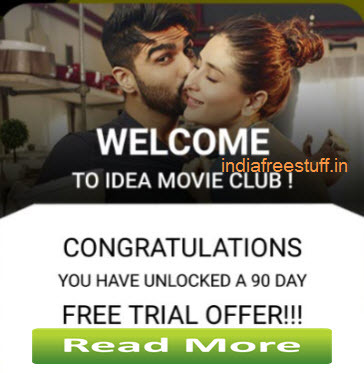 How to get Idea Movie Club Free 90 Days Trial? Enter Idea number > Verify OTP. Enjoy 90 days Trial period.